First of all, please let me say a huge thank you to Imperial Cymbals, SilverFox Percussion and everyone who entered our very first contest here at Drum Gear Review. Partnering with these excellent companies and being able to give away these beautiful instruments is the absolute best thing I’ve been able to do with this website so far. So, without further adieu, I’d like to send a big congratulations to Matthew Julian! You’ll be receiving your prizes very soon. Again, a huge thank you to everyone involved. Can’t wait to get going with our next giveaway! After spending nearly fifteen years as an employee of one of America’s most venerable drum manufacturers, BrushFire founder, Tom Osborne, has no shortage of experience when it comes to creating quality products. Building on his relationships with several of the instrument’s best and brightest – namely Buddy Rich and Gene Krupa – Osborne developed a particular reverence for the tools with which they played. Today, he’s helping players recapture those sounds with a series of handmade brushes designed to replicate those used by the masters. Osborne was nice enough to send over a pair of the BrushFire standard model, a retractable brush with .012 gauge wire and a ringed end. 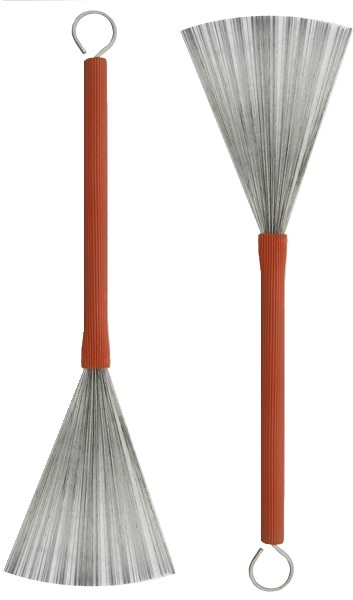 Sheathed in a salmon colored rubber sleeve with thin vertical ribbing, the brushes had a great, snug feel in hand and a very unique look – so unique, in fact, that the two times I pulled them out in front of other drummers, I was bombarded with questions about what they were. Each brush feels solid and well-constructed in hand. Just a hair heavier than my regular brushes, the BrushFires felt very nice, especially when playing figures around the drums. At no point did they feel flimsy or unbalanced; very smooth and well-suited for rapidly switching between sweeps and strokes. The wires are very soft, and have a wide spread that makes playing lush, velvety patterns as easy as any model I’ve ever used. However, they’re remarkably responsive for being so flexible. I was consistently surprised by how easily I could quickly pull out of sweeping circle, and drop right into clear, crisp double strokes. My one grievance with these very fine tools is actually the result of a feature I thoroughly enjoyed (if that makes sense). The sliding action of the handles is incredibly smooth and easy, which really impressed me. Unfortunately, the action is so smooth that the handle won’t stay in place if not opened entirely. To clarify, I sometimes like to open the brush in my left hand entirely, but only open the right brush about three-quarters of the way to give me a little bit more attack when playing a swing pattern on the snare drum. With the BrushFires, the handle would slide open after only a few strokes. However, Osborne informed me that he is working on a new model with two locking positions, offering a two inch spread, as well as the full four inch spread (you can also purchase custom models on the BrushFire website with three different spread options). Even without the locking option, the BrushFire brushes were very impressive and a lot of fun to play. They were so enjoyable, actually, that when I sat down to write this review, I picked them up one last time to put together a few final thoughts…and then I lost about thirty minutes. Total gear blackout. I was a playing them on the desk for a full half hour without even realizing it. I spend a lot of time with very nice gear, and stuff like that rarely happens. In an email exchange, Osborne summed up the care that goes into each brush by saying they’re “Hand made, like a fine guitar from Spain.” While that might seem a little indulgent when considering something as seemingly simple as brushes, I think it’s very accurate. These are incredibly well-crafted instruments, each built by a man with a wealth of experience and an obvious penchant for details. And, at less than thirty dollars shipped to your home, they’re an absolute steal. I’d encourage everyone to visit the BrushFire site to learn more about these excellent products.